Measures 5.5" x 2.75" when closed. Stainless steel. 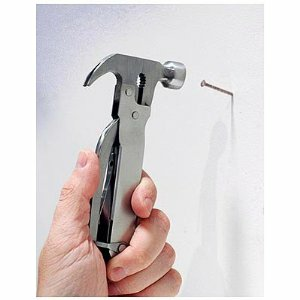 Clever tool features a hammer, plier, wedge, scissors, Philips head screwdriver, saw, file, flat head screwdriver and a knife. Handy nylon storage pouch included.